I washed my hair with Curls Clrifying Shampoo ,detangled and did a Henna treatment this past weekend. I wore loose styles for three days and I started to get nervous about what the effect would be on my hair. So, I did some serious Deep Treatment after the Henna Treatment, which I am now doing monthly. 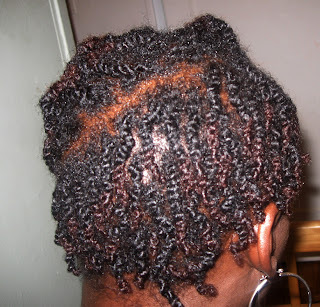 I am twisting my hair again, being very careful with seperating the two strands completely (if not completely seperated, the result would be tangles and breakage), and I do not twirl the ends anymore. I now figured that was a major culprit in my hair breakage. 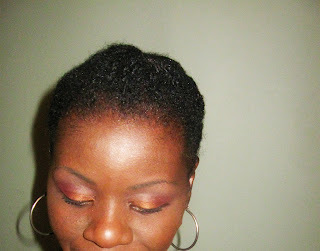 I did an assymetrical look as I was bored with the usual regular twists. I parted my hair diagonally into two sections. 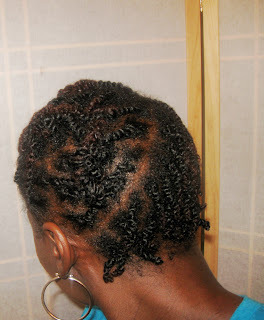 The back part was twisted wet as I wanted the twists in that section to be shorter that the twists in the front section. The front part was stretched for longer twists that would be tucked in. I maintain by spritzing with water, coconut oil and aloe vera juice, and I cover with a stocking cap. I also baggy every other day, this reall helps to retain moisture. On December 4th, I pre-pood with a mix of water, aloe vera juice and coconut oil. I then cowashed my twists pictured above with Curls Coconut Sublime Conditioner. I did that in the shower. I rinsed it out with water then some more coconut oil(1/4 cup). 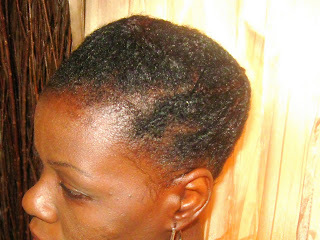 Then I deep treated my hair with Curls Ecstasy Conditioner. 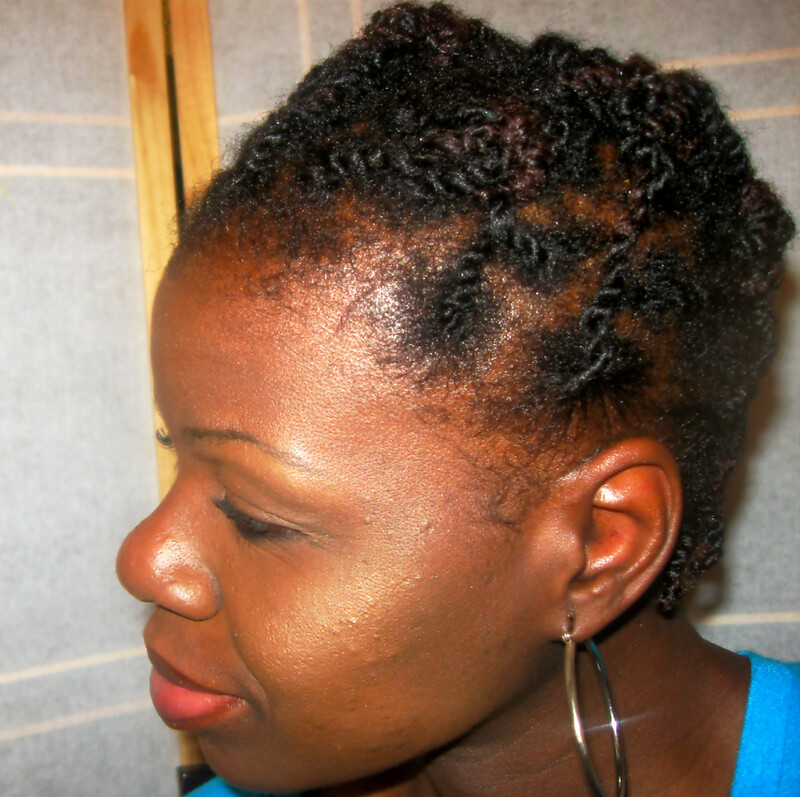 After rinsing that off, I applied my leave in, retwisted the loose twists and pinned my hair up overnight. My hair was tightly covered. Update:12/8: So I have not been touching my hair. I braided the twists in sections and tucked the ends in. I then moisturized my hair pinned up. Used a stocking cap to set it and this is the result. Love it!!!. I have managed to keep my hands out of my hair and keep my hair moisturized by tucking the ends in. 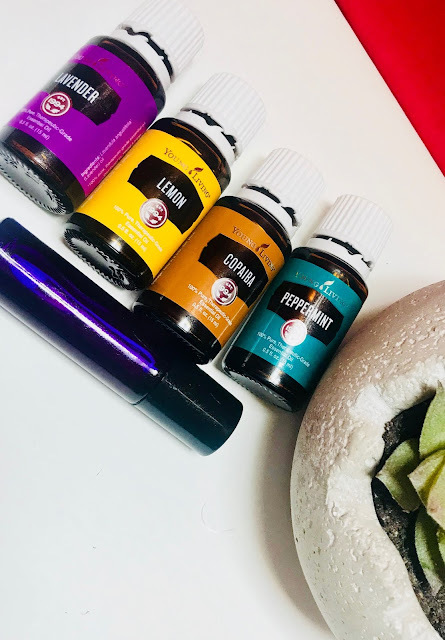 How has your experience been thus far with henna? I'm in the mood for a change, not sure if I want to cut or colour (or both?) - but have been looking up alternatives. I love it Tamara!!. I already have color in my hair and this just enhances it!!!. The color does not show well on black hair. However, I will not recommend coloring with chemicals(I lost a lot of length from doing that). I believe Henna is contributing a lot to the shine my hair now has. I have very thin hair and I have heard (curlynikki) that Henna helps thicken hair, so I am hoping for that to happen. It is not drying at all, in fact when I rinse it out, my hair feels so soft. It does kind of loosen the curl pattern, which I do not mind. For me, the tighter the curls, the more prone to breakage my hair would be. Your hair is very particular!!! Thanks you and have a wonderful day! !